Yesterday I rushed from work to Windtek where my Hot Sails GPS's were waiting for me along with my Hot Rod 97% carbon masts. It was Christmas number 3 in the space of 3 weeks for me, today could even be called Boxing day as I have so many sail boxes to try to get rid of. Last night I had the long task of putting the sail stickers on, which took most of the evening with a total of 13 stickers on each of 4 sails. But while doing it I got to see all the little extras that make this design by Tom Hammerton feel very well engineered. The very first thing I noticed when I took the first one out of its box was the perfectly fitting tapered bag, this stops the sails unrolling like they do a bit in bags. 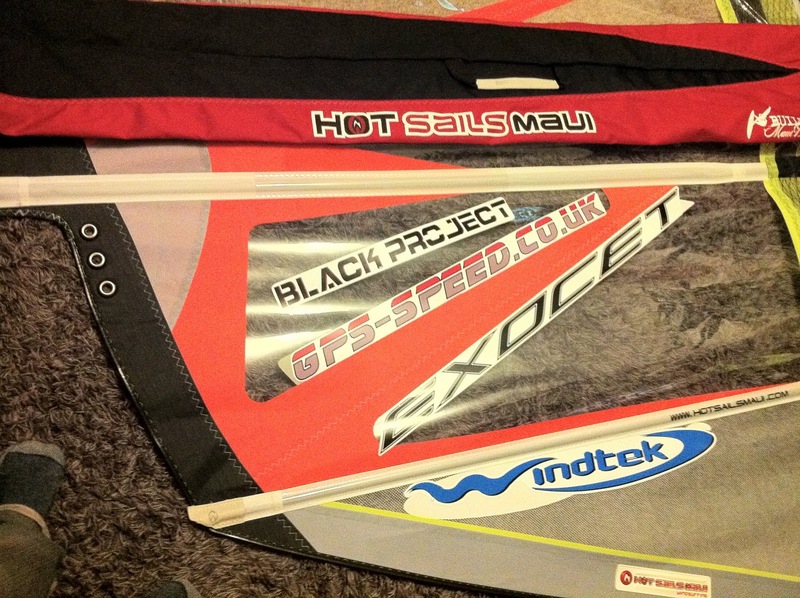 It was the first of many things that I thought really add value to what is a very reasonably priced sail when compared to other slalom sails on the market, it literally is a fraction of the price of some. 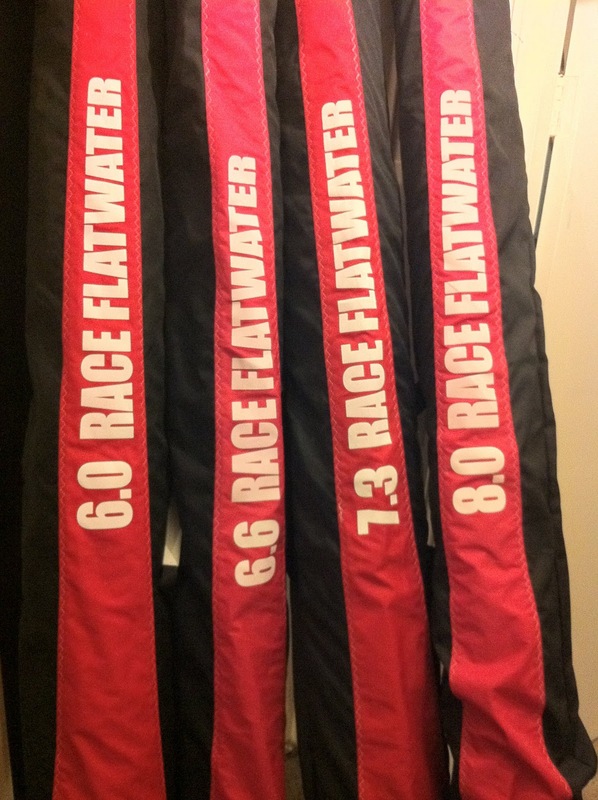 Starting with the tack strap, it is not a big and bulky as those I am used to, its a simple thick neoprene with velcro closure which tidies up the bottom when rigged beautifully. It also pulls up with little effort allowing you to thread the downhaul easily on the large brass rollers. Moving up the Luff which is made of 'WebOX', it will withstand damage from a broken mast. When you feel it you can see why, it is thick but light material, and is quite nice feel in the hands when tacking. The boom cutout has neoprene large enough to stretch and allow easy connection of the boom head, and a zip closure with large plastic salt resistant zips. At the tip of the luff there is a trim of real sailmakers leather, which is repeated on each batten end on either side, and even the handle for the bag has it to finish it off. This is such a quality extra that really made me happy (and its not just me, other people commented on it when they saw it on the beach). I would liken it to those little touches you find in a new executive car that makes the whole experience of something new even more enjoyable. The sails rig on RDM masts, something I wanted to change over to before I started on the Speed surfing journey but couldn't due to most slalom sails rigging on SDM. Another value adding extra is they are all shipped with both types of cam, which means you do not have to fork out more money if you have SDM masts. I will rig all of them on SDM's and do a full test in the future for those who want to change but want reassurance that they will work on SDM. On to the important stuff, rigging and first runs on the water. Once rigged it required a touch of tuning to the battens which is expected with a new sail, then I got on the water. As you can see by the picture at the start of the article I was quite happy! The first run and I knew I had made a good decision, some friends thought I was either mad or daft going with a brand I had never tried. After using the Black Project Fins which were designed by Tom Hammerton as well I had confidence that his designs would work. Westerly on Portland Harbour is choppy at the best of times, today was very choppy as it coincided with a double low spring tide meaning only 30cm of water for a good 100yds out in some places. This meant I could only look for flat water out in the deeper choppy water for speed runs. Also it is a slog upwind from the OTC end of the harbour to get to the flatter water at the other end. 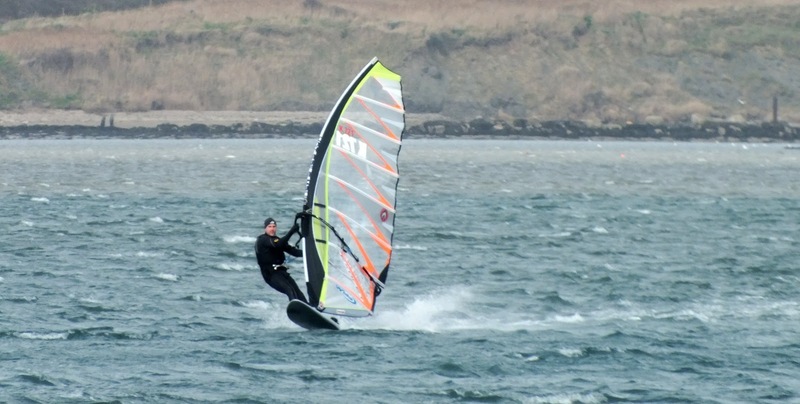 My first run I felt I was going further upwind than I usually would, and I was on a small fin for the conditions, the Black Project Type S 32cm speed fin. I only needed to move my harness lines back a touch from my guess at the end of the upwind slog, then off downwind on my Mistral SL95RD (for sale if anyone is interested) and hit 30.01 knots. This was all I needed to fall in love with the new sails, that is a best for me in low tide westerly winds. This part is hard to explain, it is a feeling you get from the kit. The sail felt locked down and never once de-powered off the wind. There was very little movement from the sail allowing me to concentrate on working the route through the rough water and keeping the nose of the board down. I had a few more runs on the Mistral and came in to adjust the settings on the sail a touch (more about trim in a future article). I went in and couldn't decide whether to change down a board size for more speed or up to train for the slalom later this year. I decided to go up and use the Exocet RS4. This did not slow me down at all, in fact it gave me more speed over distance even if the sail was a little small for the board. The Hot Sails GPS is very user friendly, it allows the rider to focus on board trim due to the stability. I would hazard a guess about why it is so stable, there is no cam on the bottom batten which may allow for some stretch and flex in the gusts more. Upwind it flies, even with speed settings from a lot of downhaul. It is a heavy sail in terms of dead weight, but feels very light on the board in my hands. The foot of the sail is low but doesn't drag in the water. When the angle is right to close the gap while riding it stays closed and the foot rests against the unused back footstrap. Due to the amount of power down low the GPS powers well through the lulls and keeps going as the wind drops, today I saw a very varied wind and only once struggled to get planing following a slow gybe, for the rest of the time I felt powered up and never overpowered. It is without a doubt the best looking sail on the water! The only problem I had today was getting the cams to fully rotate on Port tack, this I suspect was due to a fraction too much downhaul and the sail being brand new without any stretch. They went round no problem but would only hold in place with wind in the sail so I do not think it affected performance at all. I will have more time in the week to try different settings and will write about them. More news from another Hot Sails UK National Team Rider, Jon White. He took the trip to West Kirby and managed to get a PB of 42.9 with many runs over 40, with a possible 40knot 5x10sec average. 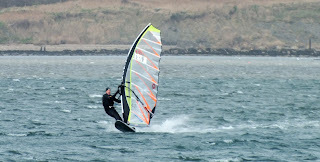 Jon was using his 5.5Hot Sails GPS with a borrowed Thommen speed50 and Black Project type s 26.5cm. Jon has a lot of experience racing on longboards but is now focussing his talents towards speedsurfing and the slalom series. 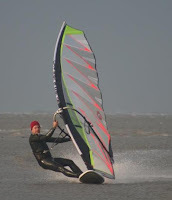 He joined Hot just before they contacted me, so far it looks like we will make a great team here in the UK along with Andy Freeman who is a long standing team rider. 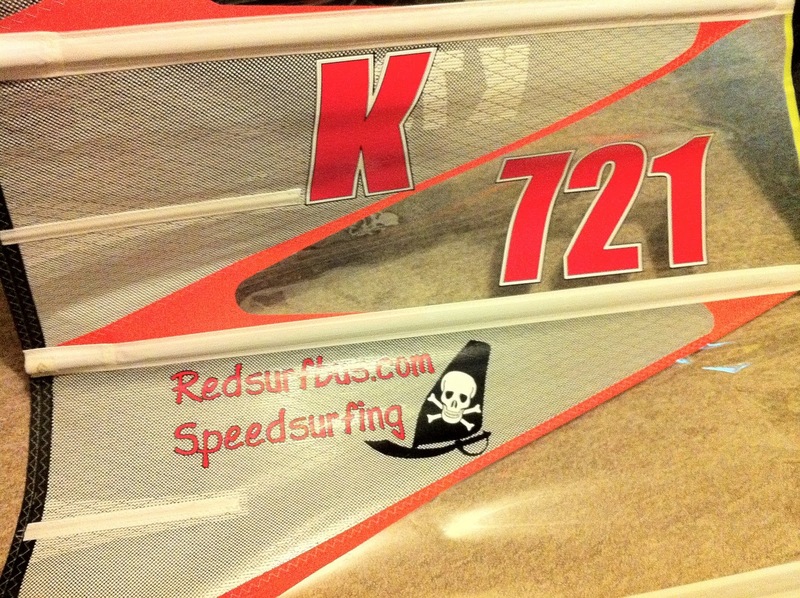 We will be getting together in Febuary to share ideas and train for the slalom in April.